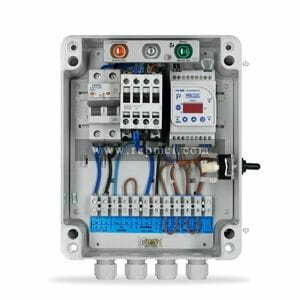 Control panel for submersible pumps with overloads and dry running control without probes for easy installation and start-up. The filling or emptying of a tank can be controlled by means of a level switch. It also allows the connection of a pressure switch. Both the single-phase and three-phase models can control motors with a maximum intensity of 12A.